MASS OF THE FERMENTING DREGS are a female post-punk band combining beautifully melancholic pop vocal melodies with bone-crushing bursts of instrumental mayhem. Formed in 2002 by 3 girls from Kobe, Japan, MOTFD honed their skills in the indie-underground scene before beating out 800 bands to win EMI’s “Road to Tarbox” audition in 2007. The girls travelled to Tarbox Road Studios in Cassadaga, NY and recorded 2 songs (“If a Surfer” and “Bears”) with renowned producer David Fridmann. 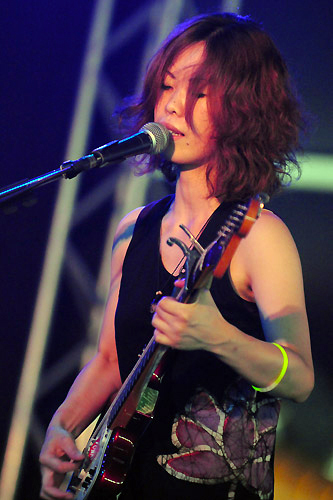 Unfortunately, drummer Reiko Gotoh would soon leave the band after recording their debut self-titled mini-album in 2007. After becoming the “permanent” support drummer for MOTFD in 2008, Isao Yoshino became an official member of the band in 2010 prior to the release of their major label debut album “ゼロコンマ、色とりどりの世界” on EMI. MOTFD are acclaimed for their intense, high energy performances on stage. Isao pulverizes the drums at a breakneck pace as Chiemi alternates between clean melodic hooks and massive riffs drenched in distortion. Natsuko prowls the stage in her dress sans footwear captivating the crowd with her seductive siren voice and leaving them awestruck with her flailing hair and thunderous bass. MASS OF THE FERMENTING DREGS rock the stage like no other female band on the planet.